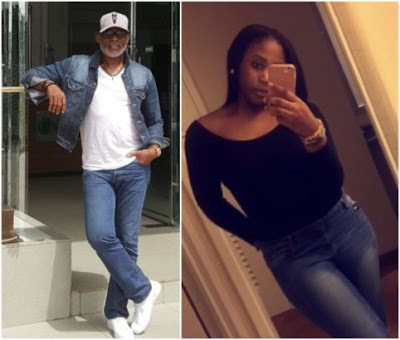 Our favourite Zaddy, Richard Mofe-Damijo a.k.a RMD’s daughter just turned 15 and the proud dad who made a decision few months ago to keep his family off social media, took to Instagram to celebrate, while also hinting that he did it because he had something to say. 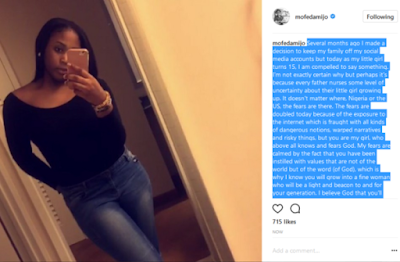 “Several months ago I made a decision to keep my family off my social media accounts but today as my little girl turns 15, I am compelled to say something. I’m not exactly certain why but perhaps it’s because every father nurses some level of uncertainty about their little girl growing up. It doesn’t matter where, Nigeria or the US, the fears are there. The fears are doubled today because of the exposure to the internet which is fraught with all kinds of dangerous notions, warped narratives and risky things, but you are my girl, who above all knows and fears God. My fears are calmed by the fact that you have been instilled with values that are not of the world but of the word (of God), which is why I know you will grow into a fine woman who will be a light and beacon to and for your generation. I believe God that you’ll continue to grow in wisdom and in grace and that the light of God’s word will always guide you to make the right choices. Make yourself and everyone that loves you proud baby. Daddy is rooting for you, so go on my sweet cakes and enjoy your day and never forget that daddy loves you silly as always.